By now you’ve heard the comment. A noted PGA Tour veteran made an off-color joke about Tiger Woods, referencing fried chicken. After the incident, and the subsequent backlash, the professional backtracked, said he meant the comments in jest, and claimed there was no racist intent. The golf and national media examined the golfer’s comments and motives, and Woods – almost begrudgingly – accepted the golfer’s apology. The incident I’m referring to happened in 1997, when Fuzzy Zoeller’s poor attempt at a joke led him to say that Woods would serve fried chicken and collard greens at the annual Masters dinner. Sadly, the description also applies to an incident that happened on Tuesday – more than 16 years after Zoeller’s racist comments – when Sergio Garcia cracked that he would serve Woods fried chicken if he had him over for dinner. These two racist moments – so far apart in timing yet so similar in meaning and context – showcase just how little progress has been made in changing racist perceptions in sports. Thursday, George O’Grady seemed to make the Garcia episode worse by claiming that most of the golfer’s friends are “colored athletes in the United States.” The Tour has accepted Garcia’s apology. These stereotypes exist in sports such as hockey. The number of black players competing in the National Hockey League is small, but the number of racist incidents seems to grow each season. Philadelphia Flyers winger Wayne Simmonds is often the victim of the more heinous acts. In a 2011 preseason game in Ontario, Canada, a fan threw a banana onto the ice as Simmonds was attempting a shot during a shootout. NHL Commissioner Gary Bettman went out of his way to say that the act was done by one individual and was not representative of Ontario or the millions of other hockey fans. Yet just sixth months later, Washington Capitals winger Joel Ward scored the game-winning goal in the 2012 Stanley Cup first round playoffs against the Boston Bruins. He didn’t get much congratulations for his performance. Instead he was peppered with racial insults and threats by angry Bruins fans on social media. And while we’ve made such little progress in the States, overseas the racism towards black players is even more horrifying. Simmonds now plays in the Czech Republic, and in his third game with new team Liberac, he was subject to “monkey” chants by the opposing team’s fans. Hockey is considered tame in comparison to the national racism that goes on in soccer. Garcia’s comments rightfully dominated the American news cycle this week, but an underreported story happened on Monday, where several top Italian teams are being fined for their fans racist chants at black players. When the vice president of the team that a star black player plays for is making public racist comments, I think it’s safe to say that the sport has a racism problem. All of these incidents – most happening in just the last couple of years – showcase a trend of racism in sports that shows no signing of going away. Often black athletes are forced to take the higher road. They accept apologies, say they’re used to this type of abuse, and try to use it as fuel to be better. But they shouldn’t have to. 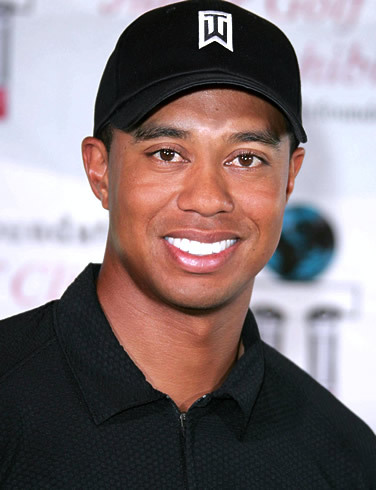 It’s 2013 and a 33-year-old golfer is still making blatantly racist comments about the most popular golfer in the world. On one hand, it’s deplorable that a thought like that crosses his mind. On the other, it’s shocking that he would even have the audacity to actually voice that opinion publicly. Woods response to Garcia was perfect. On Twitter, he rightfully called the comment “wrong, hurtful and clearly inappropriate” but offered Garcia a lifeline by saying he was “confident that there is real regret that the remark was made.” He’s doing his best to condemn the statement, but also begin the process of moving on. Woods showed incredible grace throughout the whole episode. It’s the type of grace that comes from having to deal with similar situations like this throughout his entire career. This wasn’t the first time Woods has heard from a colleague that he likes fried chicken because he’s black. And if history holds true, it probably won’t be his last.